This meal-prep recipe gives you bags of frozen fruit to toss into your blender with almond milk to make a delicious smoothie bowl base for your favorite toppings. It gives you a quick, easy, and nutritious start to busy weekday mornings. The pre-made smoothie bags include banana, mango, and pineapple. Almond milk, dragonfruit and kiwi are added fresh when you blend the bowl. 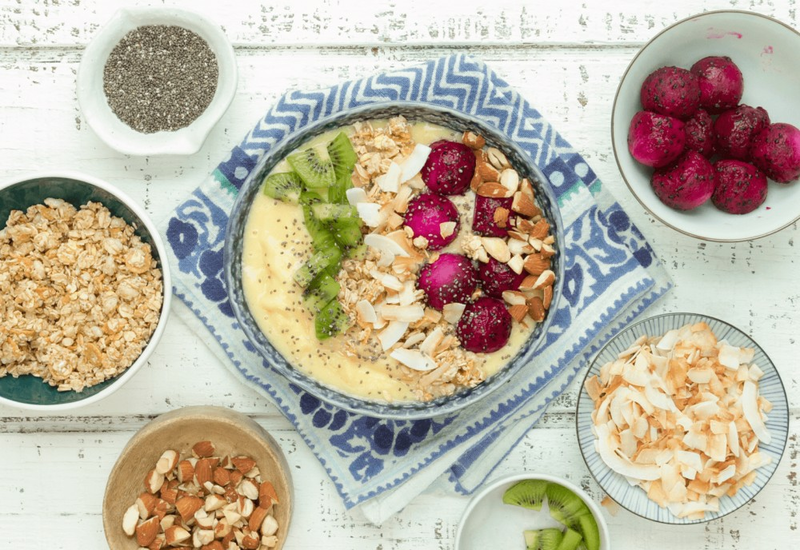 Top with your favorite assortment of granola, toasted coconut, almonds, or chia seeds! Freezing the cut fruit on baking sheets helps keep them from sticking together in the bag, making it easier for quick blending. You won't regret having this on hand in your freezer! Per Serving: 345 calories; 6g fat; 75.7g carbohydrates; 6g protein; 0mg cholesterol; 36mg sodium. Delicious Smoothie bowl! beautiful breakfast presentation that guests will love - I added berries to the mix for a punchier fruit sour & sweetness. The dragon fruit and kiwi are beautiful but more of a mild taste profile. Great for a guilt free dessert or for breakfast. I love making these pre-made smoothie bags. They are perfect for my meal prep week. I especially love the roasted almonds and toasted coconut flakes on top. By far this is one of the easiest, best tasting fruit smoothie recipes I've had. I've tried this recipe and it's so delicious! It's also the perfect consistency, I love how thick it is. I pre-made 5 bags and just grab and go, so convenient. I have a small blender that's not considered high speed, so freezing the fruit on sheet pans beforehand saved me from those agonizing mornings of trying to chop up stuck together frozen fruit. Thank you for this tip! My smoothie turned out great.